Well, folks, it’s a day that ends in “y” so that means it’s time for another post on Cardinal Walter Kasper’s life’s work of trying to dissolve the Papacy. Once again, the German readers are coming through. May God reward them for their time and effort. So, you might remember the “Thermonuclear…” post wherein Ratzinger’s opening section of his ARSH 1978 paper in the compendium “Dienst an Der Einheit”, “Der Primat des Papstes und die Einheit des Gottesvolkes” which is in English, “The Primacy of the Pope and the Unity of the People of God” considers the hypothesis of a Papacy containing three members, because God is a Trinity, and thus a monarchical papacy is an intrinsically “Arian” structure. This comes from a theologian of the early 20th century, Erik Peterson. Well, guess who else is talking about this hypothesis in the very same book? Yep. Walter Kasper. 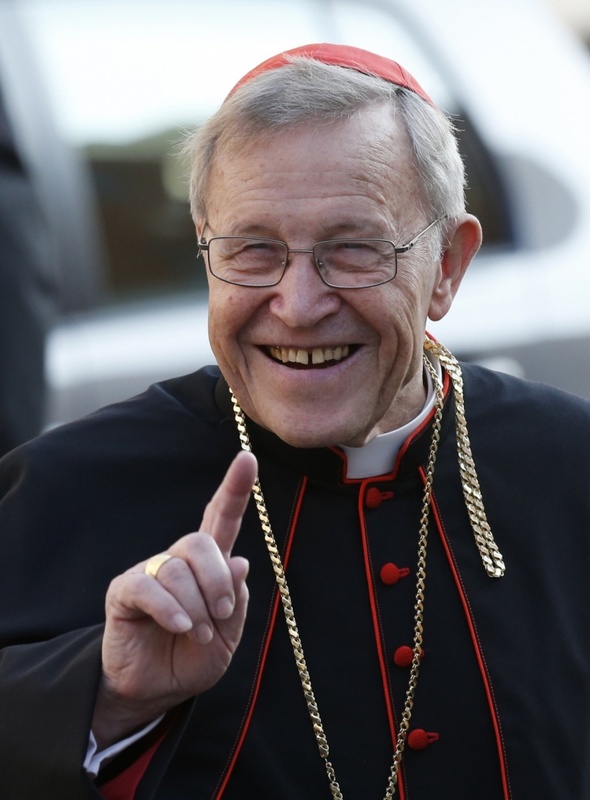 As in the Cardinal Walter Kasper who is the head of the Sankt Gallen Mafia that pressured Pope Benedict to resign and installed his boy Jorge Bergoglio as Antipope, and is Antipope Bergoglio’s puppet master. Except Kasper is MUCH friendlier to it. Imagine that. I’m going to turn it over to the German readers now…. You will recall that Ratzinger on page 167 of the book “Dienst an der Einheit” referred to Erik Peterson’s obscure 1935 work “Monotheism as a political problem”, wherein Peterson surmised that the favour shown to Arianism by the emepror was due to the monotheistic model being a convenient theological corollary of the emperor’s political status. And also how Ratzinger mentioned that this idea was taken further by some, even as far as proposing a trinitarian model of the papacy (as in Solovyev’s writings), in contradistinction to an Arian “Monotheist” model. But it was still unclear why Ratzinger would have mentioned such an obscure work in the first place. Guess who cites this exact same obscure work by Peterson, 64 pages earlier in “Dienst an der Einheit”, on page 103? Walter Kasper. And Kasper has his own trinitarian model dreamt up. For Kasper, it is the Church, the Petrine Ministry and the Spirit that make up this “trinity”, even using the term “perichoresis” to describe this interaction. Perichoresis, as you no doubt know, is the term for the divine indwelling of each Divine Person in the other two. Earlier in the text Kasper takes pains to deny that the monarchial nature of the Petrine Office is ius divinum, and also seeking to deny the jurisdictional nature of the papacy, instead claiming it has more to do with Roman Law than with the Gospel. This is important because Kasper recently referred to his puppet, Antipope Bergoglio, as “the first post-Constantinian pope”. Back to the Germans…. I came across this interview with Kasper on the kath.net website from 21 Feb, 2018 . The relevant parts are translated below. In it, he implicitly denies papal jurisdiction, compares Bergoglio to Christ, and effectively denies both the priesthood and the Eucharistic sacrifice. What Kasper means here is the jettisonning of the idea of the universal jurisdiction of the papacy, something which he has in his other writings associated with Roman Law, not with Divine relevation. You also have to wonder what on earth Kasper would know about a poor Church. Die eigentliche Diskussion nach dem Konzil betraf nicht primär die Frage einer angemesseneren Verteilung der Jurisdiktion zwischen Papst und Bischöfen. Die nachkonziliare Diskussion frage viel grundsätzlicher, als das Konzil es getan hatte, nach dem theologischen Sinn und der theologischen Berechtigung von Jurisdiktion überhaupt. Sie stellte den Jurisdiktionsprimat nicht erst in seiner konkreten Ausübung, sondern in seiner tiefsten Wurzel in Frage. “The actual discussion after the [Second Vatican] Council did not primarily concern the question of a more appropriate distribution of jurisdiction between Pope and bishops. The post-conciliar discussion questioned much more fundamentally than the Council had done, regarding the theological meaning and the theological justification of jurisdiction in general. It questioned the primacy of jurisdiction not only in its concrete exercise, but in its deepest root. Der Terminus Jurisdiktion ist ursprünglich im römischen Recht zu Hause; im kanonischen Recht wurde er nicht etwa abgeschwächt, sondern viel mehr erweitert. Aus bloßer Gerictsgewalt wurde eine hoheitliche Gewalt, die Gesetzgebung, Rechtsprechung und Verwaltung einschließt. Kann ein solcher Begriff, so fragte man, geeignet sein, die brüderliche Grundstruktur der Kirche und den Dienstcharakter, der allen kirchlichen Ämtern nach dem Zweiten Vatikanischen Konzil eigen ist, auszudrücken? Kommt ein Jurisdiktionsprimat, wie er vom Ersten Vatikanischen Konzil definiert wurde, nicht von vornherein einem Angriff gegen die christliche Freiheit gleich? Schließlich verbanden sich mit dem kirchenrechtlichen Begriff der Jurisdiktion im Lauf der Geschichte immer wieder Vorstellungen von der Monarchie als der vollkommensten Staatsform; im Vorfeld und im Umkreis des Ersten Vatikanums verband sich damit, wie die Forschungen vom H.L. Pottmeyer und E. Weinzierl aufgezeigt haben, eine ausgesprochen antineuzeitliche und antidemokratische Authoritäts- und Gehorsamsphilosophie. Man wollte dem, wie man meinte, alles auflösenden nihilistischen Prinzip der neuzeitlichen Autonomie das katholisches Prinzip der Authorität und des Gehorsams entgegenstellen. Gerade dieser letzte Gesichtspunkt macht verständlich, weshald die allgemeine Amts- und Autoritätskrise der letzten beiden Jahrzehnten in der Krise des Petrusamtes ihre letzte Zuspitzung fand. Eine Neubesinnung auf den theologischen Sinn von Jurisdiktion und damit auch des Jurisdiktionsprimats ist deshalb unumgänglich. But remember, there’s nothing to see here, folks, and you are stupid, insane and a schismatic if you think that there is. Also, if you think there is anything anyone can do about this, you are a bad person who doesn’t pray and doesn’t trust God and is lacking in humility. Or something. This entry was posted in Uncategorized on February 4, ARSH 2019 by Ann Barnhardt.